Gov. 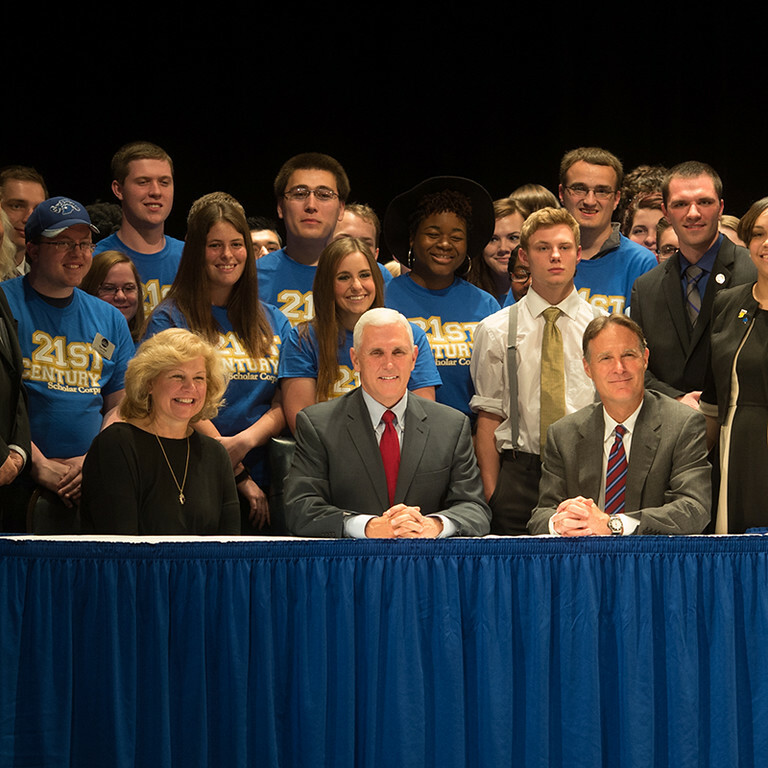 Mike Pence signed Thursday at Indiana State University an executive order to formally change the name of the 21st Century Scholarship Program to the Evan Bayh 21st Century Scholars Program. Bayh, who served as the 46th governor of Indiana 1989-1997, made the scholarship a top priority during his tenure, with the goal of helping ensure Indiana students afford the opportunities provided by post-secondary education. "Thanks to the vision of former Gov. Evan Bayh more than 25 years ago, tens of thousands of Hoosier students have taken advantage of the 21st Century Scholars program as a way to achieve their goal of going to college," Pence said. "This program offers students across our state a path to educational success, and I'm proud of the students who have committed to developing the character traits and work ethic that will carry them into adulthood. I'm grateful to sign this executive order to formally recognize the man who made the dreams of these students a reality." Pence was joined by Bayh, former state representative and commissioner for higher education Stan Jones, who authored the legislation that created the scholarship program, Indiana State University President Dan Bradley, state leaders and dozens of current and former 21st Century Scholars to recognize the occasion at Indiana State's Bayh College of Education. Founded in 1990 and signed by Bayh, the 21st Century Scholars program has provided scholarships to more than 70,000 Hoosier students - many of whom were the first in their families to attend college. According to the Indiana Commission for Higher Education, 21st Century Scholars are more likely to go to college than their peers and are more likely to be academically prepared and complete a degree than their low-income peers. Students who meet certain income requirements can apply for the 21st Century Scholars program during seventh or eighth grade and must complete several steps, including signing a pledge to not use illegal drugs or alcohol or commit a criminal act, maintaining a cumulative 2.5 GPA, graduating high school with a Core 40 diploma and applying to an eligible Indiana college. 21st Century Scholars can receive a maximum of four years paid undergraduate tuition at a state college. In 2013, Pence signed into law legislation (House Enrolled Act 1348) that added an additional prerequisite to the 21st Century Scholars Program, which required students take at least 30 credit hours of courses per academic year. The change resulted in a double-digit increase in the number of scholars staying on track to complete their degrees. Since Pence took office, Indiana has more than doubled funding for the 21st Century Scholars program. Indiana is currently ranked first in the Midwest and seventh nationally in providing need-based financial aid. To learn more about Indiana's Evan Bayh 21st Century Scholars program, go to http://scholars.in.gov/. Photo: https://photos.smugmug.com/photos/i-xwvCLPn/0/XL/i-xwvCLPn-XL.jpg -- Gov. Mike Pence and former Gov. Evan Bayh were joined by state leaders and dozens of current and former 21st Century Scholars to recognize the occasion at Indiana State's Bayh College of Education.